Use a light charcoal (we prefer standard Kingsford.) Allow the roaster to heat up to 150°. Prepare the lamb and rub olive oil all over it. Make a mixture using salt, pepper, 6 cloves of minced garlic, and rosemary leaves. Sprinkle the mixture on the legs of lamb. Just make sure to rub all the spots of the lamb to spread the seasoning evenly throughout. 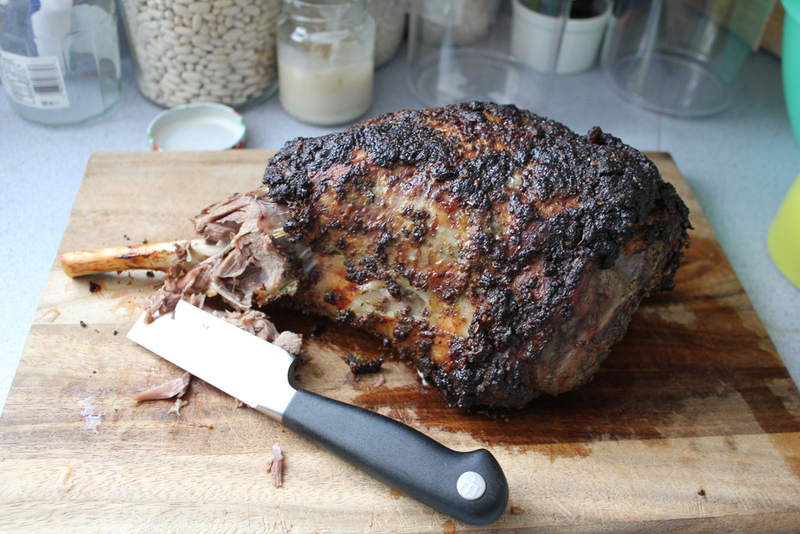 Get 12 tablespoons of mustard and spread it over the legs of lamb. On the drip pan, arrange the onions and remaining garlic and rosemary. Place the legs of lamb over the onions and add the other ingredients. Close the Roasting Box in order to roast the legs of lamb for approximately 3 hours. Add fresh charcoal every hour as per the instructions on the side of your roaster. After 3 hours, check the meat and add fresh charcoal in order to increase the temperature of the cooker to 225 degrees. Roast the legs of lamb for about 20 minutes they brown. Open the roasting box and check the internal temperature of the meat. After the meat is cooked, serve it with the side dishes of your choice. This delicious caja asadora Leg of Lamb recipe is good for 12 servings or more depending on the size of the legs of lamb. It is a wonderful option for those looking for a unique meal that is both elegant and perfect for hosting. This recipe will bring joy to your loved ones. This summer, broaden your culinary horizons and expose your taste buds to this Mouth-Watering Leg of Lamb China Box Recipe using La Caja China or La Caja Asadora grills. They will surely enjoy this recipe as well as the wide spectrum of other barbeque dishes you can make! To purchase your Caja China box now choose from the largest selection of roasters on the market, order here. Want to upgrade your menu…offer dishes from you Caja China! Being quite the foodie with a love for eating out I couldn’t help but think why more restaurants don’t offer dishes they cook in a Caja China. The Roasting Box (aka cajun microwave) isn’t only meant for whole pigs, it can be the start of innumerable delicious dishes restricted only by the creative mind of the chef. Among the most popular dishes are pork shoulder, duck, lamb, fish, and even clam bakes! The possibilities that La Caja China offers truly are endless. I started doing a bit of research online and found that there are some restaurants who are now featuring dishes prepared in lacajachina for special celebrations. Some establishments actually cook a whole pig for Sunday brunch while others have a different item everyday on the menu. An excellent example of this growing trend can be found in Phoenix, where at The Mission and Cafe Blink, which were highlighted in The Phoenix New Times. I think this is an ingenious idea and these chef’s should be applauded for spicing up their menu and giving their guests a reason to come back. If you look at this from a business perspective it makes total sense! 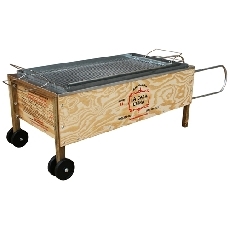 You, as a chef, purchase a caja asadora for roughly $189 plus shipping. You buy your meat, let’s take a whole 80lb pig, and roast it for approximately 5 hours, you know have enough meat to feed roughly 80 people or more. Give a price range of each meal anywhere from $10-25 and you have paid your initial investment your first day. How many different main dishes and appetizers can you create? That’s really up to you. Not only can you provide different foods on your menu but you can create an exciting atmosphere if you decide to bring the cooking to the front of the house and treat your patrons to the thrill of cooking with a China Box. Let them witness how those new dishes come to life by creating a treat for every sense…I would definitely make a reservation! You will be the talk of the town by thinking outside of the box and cooking inside of the box…La Caja China. La Caja China: How Much Hog is enough? How To Roast A Pig by Tom Rea gives us a few tips and tricks on how to use your Caja China Roasting box and what you will need. Some of those who have never cooked with La Caja China can have some issues trying to understand how much is too much and how much is enough. Don’t over think it, this is probably the easiest thing to remember. When buying a whole hog for roasting you need to order 2 pounds (905 g) of meat ( not including the weight of the head) per person. Really, it is that simple, and you do not have to worry about the weight of the head because whoever you are ordering from will be able to accurately guesstimate the weight of a pig without the head for you. Once cooked and removed from the bones, this will provide roughly 8 ounces (225 g) of meat per person. But, when ordering meat, it is always best to get a few extra portions to ensure that everyone can eat his or her fill and you can still have some meat remaining for sandwiches the next day. What should I ask for when I order? To order a pig for spit roasting, simply ask for a whole dressed pig in the weight you require. It is up to you whether you wish to have the head on or off. 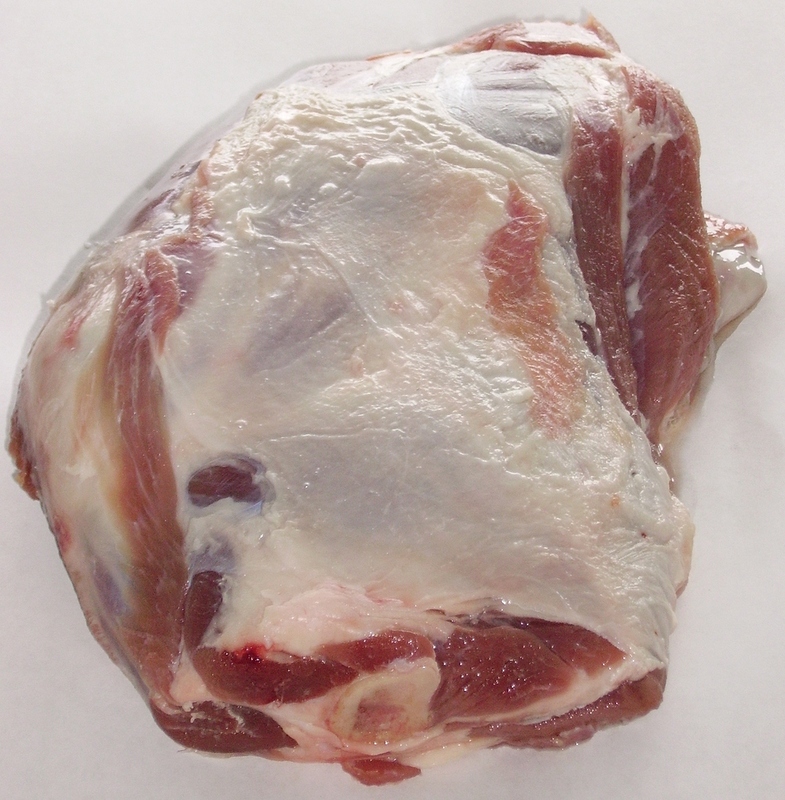 But, by removing it you are missing out on the amazing pig cheeks that will have confit in their own fat, making them succulent, flavorful, and best pieces of meat in you roast. If your pig is too big for your pig roaster all you will need to do is remove the bottom of the legs and the head. Use a sharp heavy knife like a cleaver and a sterilized hacksaw to cut through the bones. When your going to prepare a whole pig roast your going to need some equipment. Most of the basic tools required will already be sitting in your kitchen. But, there are some important tools that will definitely some in handy as the cooking begins. No need to go overboard but as long as you have the essential equipment laid out in this section you will have everything you need to get the job done. Hope this was helpful!! 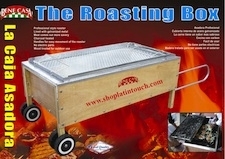 For more information or any questions feel free to contact us at 888-272-7629 or shop our products at http://www.shoplatintouch.com to prepare for your Caja China roasting this holiday. In a food processor, combine the salt, pepper, garlic cloves, rosemary and paprika, and process until fine. Add olive oil and pulse to form a paste. Pat the rib roast dry with a paper towel or napkin. Place the prime rib roasts on a cutting board, bone-side up and rub each with 1 tablespoon of the salt paste. Pack the prime rib roasts on a cutting board, bone-side up and rub each with 1 tablespoon of the salt paste. Pack the salt paste all over the fatty surface of both roasts, pressing to help it adhere. Let the prime ribs stand at room temperature for 2 hours. Insert meat thermometer so tip is in thickest part of beef, not resting in fat or touching bone. Place disposable pans beneath the Caja China rack to catch the drippings, tent ribs loosely with foil, and close the box. Add 16 lbs. of charcoal for model #1 or 20 lbs. for model #2 or semi-pro box, divided into two piles, and light up. At 30 minutes, spread coals over surface. Cooking time starts now. At 1 hour ( cooking time), lift the lid and quickly baste the roasts, and re-tent the foil. Dump excess ashes, close La Caja China and add another 10 lbs. of unlit coals. After 2 hours (cooking time), baste again, remove the foil, and close the box to brown the top of the roasts. Cook until rib roasts reach an internal temperature of 120 degrees F. Then remove the foil and brown 10 to 15 minutes longer. Remove the roasts from La Caja China, cover with aluminum foil, transfer the roasts to a large carving board, and let the meat rest for 30 minutes. Remember, the rib roast will continue to cook as it sets. The temperature will rise from 125 degrees F to 130-135 degree internal temperature ( medium rare) at 15 to 20 minutes. If allowed to rest as long as an hour, the temperature will rise even higher. Carefully lift the salt crust off the meat and transfer to a bowl. Brush away any excess salt. To remove the roast in one piece while keeping the rib rack intact, run a long sharp carving knife along the bones, using them as your guide. Carve the prime rib roast 1-inch thick and serve, passing some of the crumbled salt crust as a condiment. These Cajun Microwaves will have you wondering why you don’t cook with a Caja China for every special occasion. More Great Recipes to come! Join us on Facebook and Twitter for all the goings on (events, contests, podcasts, etc.) We love to hear from you and exchange ideas! Have a wonderful holiday season, and happy roasting! There are many ways to roast a whole pig. Those of you that have tried out La Caja China or have seen it being used know that this way of roasting is as close to perfect as you can get, but if you are looking for something a little different a Spit Roaster is the way to go. The key to this cooking style is the rotation. Rotation during cooking is very is important for many reasons, the most obvious of reasons would be that it evenly distributes the heat over the meat. The second is that the rotation causes the meat to baste itself during the cooking process which helps to keep the meat moist. When you are looking for a spit rotisserie you have to put into consideration the ease of use. You don’t want to buy a product that you are going to regret purchasing the minute you start to cook with it. The clear winners for this argument are the electric and gas spit rotisseries. These allow you to have complete minute-by-minute control over the heat that is emitted at the turn of a dial. Cooking with a Spit rotisserie is a great alternative because it can feed a lot of people in comparison to any barbecue or a buffet. You have the option of using electric or gas and you have complete control over distribution of heat with the amount of coal or the intensity of the burner that you have underneath each area. This allows you to slow cook tough areas and quickly cook the tender areas of the carcass. This style of cooking does take a while but the process and hours are definitely worth it. One of the best Spit Rotisseries we have to offer is the Spit Rotisserie/ Electric measuring at 52″ inches in length x 23″ inches in width. This rotisserie comes equipped with a heavy duty electric motor. It also comes with a one year warranty guarantee from the manufacturer. Other components include: 9/16 Stainless Steel Skewer with 2 removable hooks, 18 Gauge Steel Base, 7 foot motor cord with on/off switch, 3 position motor mounts, and removable grease collector. This specific product has been on the market for thirty-nine years and is still one of the best. For those looking to cook a larger pig we also have a Spit Rotisserie Stainless Steel 100 lbs. This product is 51″ inches in length and 22″ inches in width. It is UL Approved Motor tested for up to 100 lbs of meat. The components included are: a spit rod which is 51″ inches in length, 4 RPM-S motor speed with all metal gears, stainless steel rotisserie construction, two stainless cooking grills for up to 500 square inches of cooking capacity, spit forks, a spine hook for stability, wheels for easy portability, and stainless wind shield to reduce charcoal usage and add flavor. Also a one year warranty on motor and all parts. The time of the year is coming!! Join us during the holidays with this popular cultural roasting tradition. Feel free to send us pictures or messages including your memorable roasting experiences. For more information please contact us at 888-272-7629. Which La Caja China or Caja Asadora is Right for You? How do you know which Caja China is best for you? This famous Roasting Box has only been around for a few years now. In the old days traditional Cubans would dig a hole in the ground, lay the pig out, and place the coals on a rack right on top, but that process can be very time consuming and definitely a little messy. The first Caja China style Roasting Box was made in 1987 and the idea and designs for these traditional this traditional Latin cooking style have come a very long way. The most economical Chinese Box, which is very popular for personal use would be the Caja China style Roasting Box for up to a 70 lb pig roast. This is a professional great style for beginners that are looking to cook a little more often for a smaller family gathering or special event. Now for those of you who are looking to jump into something a little bigger and also a great quality pig roaster the best choice for you may be La Caja China #2 we like to refer to this Cajun Microwave as THE BIG BOY! It comes lined with aluminum and can cook up to a 100 lb live pig and much more. They are extremely durable and will last a lifetime with the proper protection and care. This China Box is as good as any top of the line pig roaster out there without having to completely empty your pockets. Some Caja China’s can cost up to $1,500 so this is a great product at an amazingly affordable price. Each of these China Boxes comes with all the necessary components such as: a charcoal pan and grid, large dipping pan, 2 stainless steel racks, 4 stainless steel “S” hooks, 4 front wheels for easy mobility, 2 large steel handles, syringe for marinating, and a detailed instruction manual. For those who run a restaurant, catering company, hotel, or other establishment that would like to spice up their cuisine and offer guests an event that is fresh and unique, as well as delicious. This model may be best suited for your needs. With the exception of our aluminum exterior SP-150 & SP-300 models, it is the most economical way to roast up to 100 lbs. with mouth watering results every time. If your not really interested in cooking a pig these options can still be a great fit for you for any occasion. These Caja China’s can cook whole chickens, racks of ribs, a small lamb, or you have the option of cooking different types of meat at the same time. These styles are the most common on the market and are useful for any of your roasting needs. 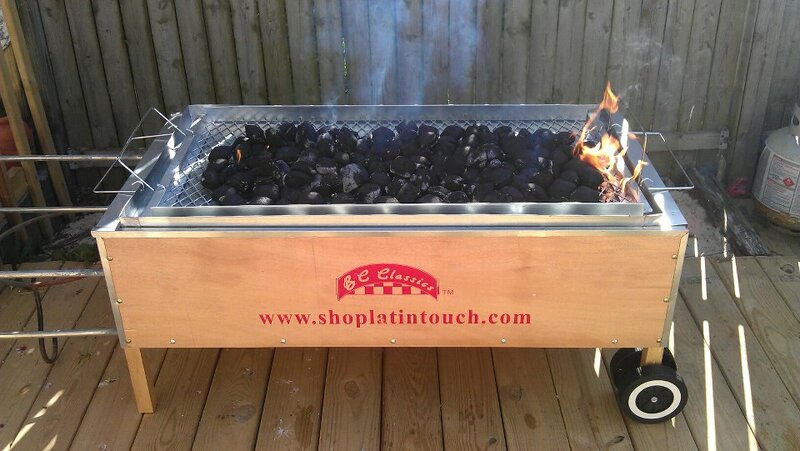 A perfect example of a grill that is designed and known for something other than pork would be the La Caja China #3. This model holds up to about 18 lbs, and is most commonly used for turkey, pork shoulders, chickens, or duck. This is a great unit for those who may not have the room to store a full size 48 x 24″ Roasting Box but still enjoy the delicious results. The dimensions of this roaster are 28″ L x 14 1/2″ W x 9″ interior depth. 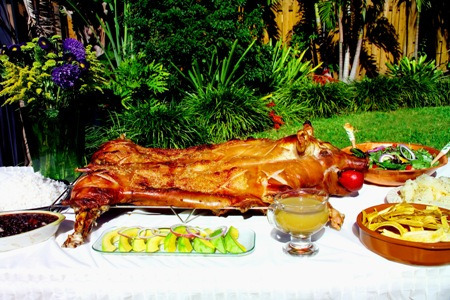 With father’s day approaching my family is getting ready to celebrate another holiday with the typical pig roast in our La Caja China. It seem’s that every holiday is an excuse to get together and enjoy some delicious food and drinks in my family…Christmas Eve or Noche Buena as we call it, New Years Eve, Easter, Memorial Day, Labor Day, 4th of July, Mother’s Day and Father’s Day…I think you get the point. 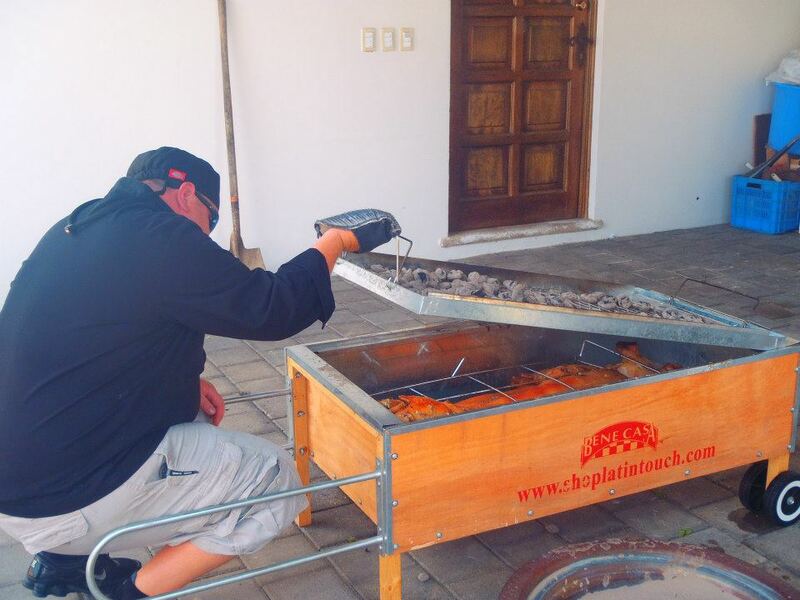 That is not to mention the birthdays, anniversaries, weddings and baby showers that our roasting box makes an appearance at, it is no wonder why each house in my family circle has their very own caja asadora. This tradition of family gatherings over a pig roast stems back from our lovely homeland of Cuban. 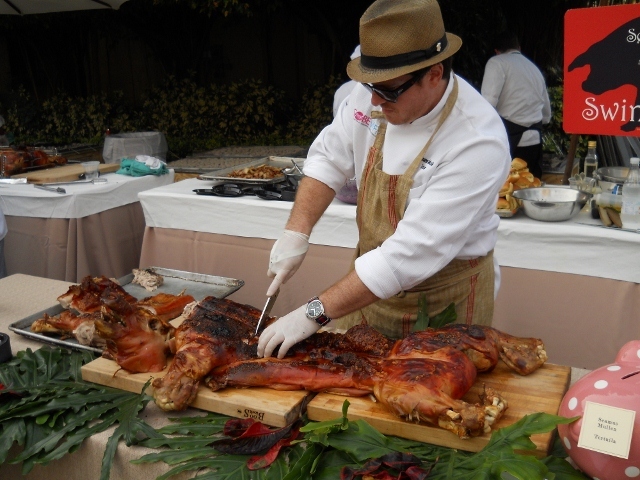 Roasting a 50 Lb pig was an easy way to feed a lot of family and friend’s during special celebrations, pair it with rice and black beans, fried plantains (maduros), yuca and salad and you have a lot of happy people. When my family migrated to Miami, FL the traditions came with them. As I grew up I have many, many memories that include lacajachina, so many in fact that I feel like it is part of the family! This year I think I might get my dad a new roasting box and I thought what better day than Father’s Day, except this will not be any regular roasting box…I am going to have it personalized with our family name on the side of the box (replacing the logo in the picture below), I think it’s time to make it a legit part of the family. I am sure my uncles are going to be jealous but hey, this always makes for great family gatherings! June 16th is Father’s Day so I am giving you a heads up if it slipped your mind. Take care of your dad’s on this special day and maybe you can give him a gift that will start a new family tradition.